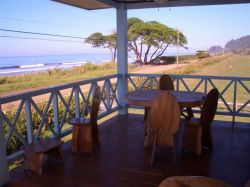 Welcome to our selection of holiday homes to rent in Costa Rica. Located between Nicaragua and Panama in the Central American isthmus, the small country of Costa Rica is popular with tourists thanks to its natural beauty, environmentally friendly attractions, pleasant beaches and warm climate. Its official language is Spanish, though English is also widely spoken, while the US dollar is accepted in many tourist destinations, as well as the local Costa Rican colon. The government of Costa Rica have focused on protecting their environment for many years, and in fact regularly place highly in the list of greenest countries in the world. Eco-tourism is very popular here, with few large resorts and environmentally friendly activities and attractions. 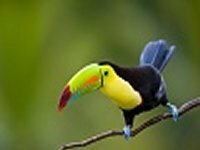 Costa Rica is home to several national parks which all offer stunning natural scenery, outdoor activities as well as some more unusual and unique attractions. The Monteverde Cloud Forest Reserve, an area of woods at high altitude which are often shrouded by mist and clouds, can provide amazing views over the surrounding countryside. You should come prepared for cooler weather at these heights, though. The Corcovado National Park is home to the only lowland tropical rainforest in the world, which is the habitat of many unusual and intriguing local species, such as the rare Harbor Squirrel Monkey. There are dozens of hiking trails in this part of Costa Rica, and local guides will be happy to take you to the best sites. The national park at Tortuguero is around the edge of a tropical lagoon where marine turtles nest, while Cahuita is not only home to a stunning coral reef, but there are also several pleasant beaches within the area. One of Costa Rica's main attractions is the Arenal volcano, near the town of La Fortuna. This small village offers great views of the volcano during the day and the night when visitors can see the bright red lava rocks tumbling down its slopes. There is also a hot springs resort nearby if you want to spend some time relaxing in La Fortuna. There are plenty of other places to relax in Costa Rica too, as the coastline is home to dozens of pretty beaches, some with tourist facilities while others have remained completely unspoilt. Nosara is just one of those unspoilt towns, with its peaceful local community, while Playa Domeical is much more of a traditional tourist resort. Popular with surfers, the beaches here are backed by stunning, dense rainforest. Puerto Viejo is the place to head if you like your beach holidays active; not only are the waves ideal for surfing here too, but the offshore reef is popular with divers and there are numerous onshore activities on offer too, like horse riding on the beach and mountain biking. 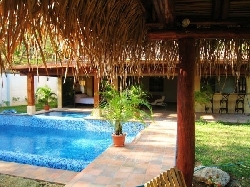 Looking for self catering holiday accommodation in Costa Rica? then below is a selection of villas in Costa Rica and apartments in Costa Rica that can be rented direct from their owners. You can either click on each listing for further details or you can use our search engine on the left if you are looking for something in particular.